Our puppy Questionaire is our first way of getting to know you and your family. We do ask a lot of questions. All of which are very important for us to decide on many things. First whether one of our WSS is a right fit for you or your family. If we think that you are a good match then it helps us to get to know you and your family and what type of temperment you might be either looking for or in need of. After this questionaire, if we agree a puppy from our kennel will match you or your family, then we will send you some more questions that will go more indepth into helping us to match you with the right puppy. 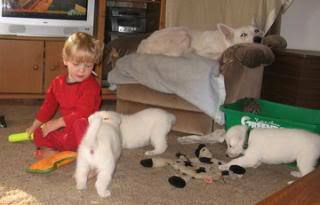 I am very much a hands on breeder who prefers to stay in contact with the adopters of our puppies. Either to give advice when asked, support when needed or just as a friend to share in the joys and challenges of this beautiful breed. This questionaire starts that whole process. Please copy and past it into the contact form below with the answers to the questions. Then hit submit. I am a busy mom as well and we have a large family so please do not be upset if it takes me 2 days to a week to answer. I will answer in as timely a manner as I can. 5. Are you financially able to care for a dog? 6. What do you want a puppy for (work, pet, show, therapy, etc)? 7. Do you plan on competing in any events with your new friend (agility, obedience, herding, flyball, etc)? 13. Is everybody in agreement in the purchase of this puppy? 17. Are you willing to take the responsibility of training with your puppy? 20. If you rent, are you in an apartment/duplex and is your landlord ok with the purchase of this animal? Could you provide documentation to show approval? 21. Are you in a city, village or country? 22. Do you have a fenced yard? If so how big? If not how do you plan to exercise the puppy/dog? 23. Will your dog be an indoor or outdoor dog? 24. Where will the puppy spend the day and night? 25. Are you familiar with crate training, and if so, will you be using that method? 26. Where will the puppy sleep? 28. Will the puppy have contact with the family throughout the day? 29. 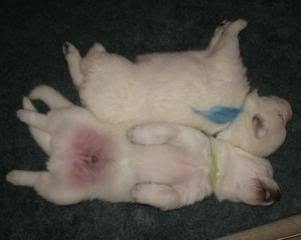 Do you realize that White Shepherds are large dogs and they shed several times throughout the year? 30. Do you travel much, and if so, what will you do with the puppy when you do? 31. What temperament/personality would you prefer your puppy to have? 32. Please give any other information that you think will help in matching you with the right lifelong companion? 33. Provide us with a name, address and phone number of your Veterinarian (s)? 34. If you don't own animals, please provide us with a vet that you plan to use. 35. How active would you say you and your family are?